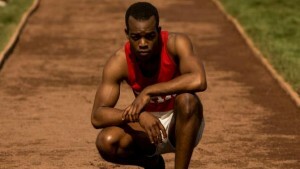 Stephen Hopkins’ Race, a biopic focusing on track and field legend Jesse Owens, winner of four gold medals at the Berlin Olympics, stars Stephan James as “the fastest man alive” and living disproof of Adolf Hitler’s belief in Aryan superiority. James’ performance is not so much played as inhabited by the gifted actor. I had the fortune of watching it with 65 students from Philadelphia public schools, most of them sprinters like Owens, and their enthusiasm heated up by several degrees my own lukewarm reaction. Many of them had never heard of Owens and were unfamiliar with his story, struggle and Olympic victories. While I think it’s a good rather than a great film, I’m rooting for its success as you can read here. Even with a story as universal as that of Owens, there’s a lingering superstition in Hollywood that white people won’t see movies about non-whites. This superstition has been disproved by films as far-flung as Bend it Like Beckham, 12 Years a Slave and Selma just as surelyy as Owens disproved Hitler’s racial theories. Are there films about which you’re ambivalent that you enjoyed watching and would recommend? © COPYRIGHT 2019 CARRIE RICKEY. ALL RIGHTS RESERVED.